We weren't trying to pick the 10 most important days. 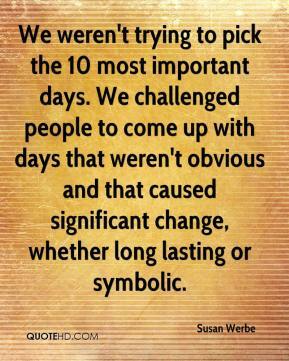 We challenged people to come up with days that weren't obvious and that caused significant change, whether long lasting or symbolic. We're always looking for new, fresh ways to document history. I had the idea a couple of years ago to bring together 10 of the best and the brightest, most independent filmmakers, people who had not worked for The History Channel before, to each direct one hour of a series that documents days, events and moments that reflect who we are as a nation and how we got to be this way.